The nation added only 126,000 jobs in March, while the unemployment rate was unchanged at 5.5 percent. Those terrific numbers from January and February now look a bit less terrific, as revisions subtracted 69,000 positions from the previously reported job gains. In a silver lining to the soft numbers on job gains, average hourly earnings rose 0.3 percent, continuing the erratic, muddy picture that is emerging on whether American workers are starting to see meaningful wage gains. 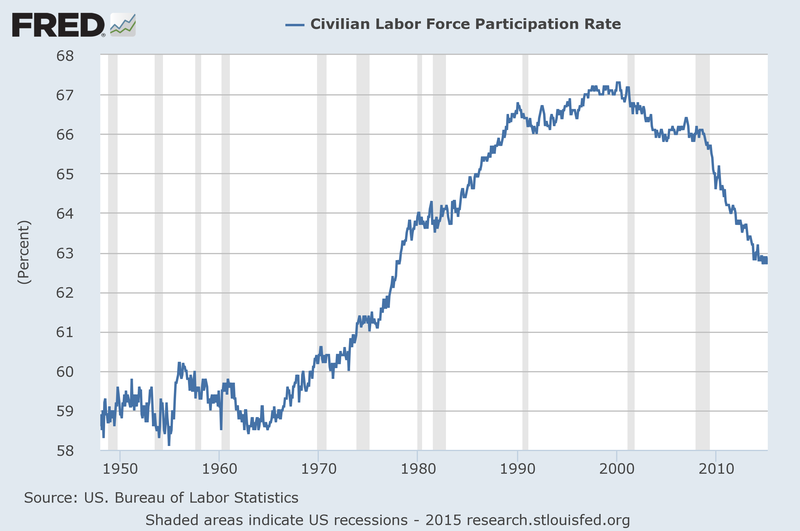 A better picture to use would be the labor force participation rate. It does not seem that the US economy is in a boom. Even though job creation wasn’t bad in the last quarters, the 63% participation rate is still very far from where it was since the late 1980s: somewhere between 66% and 67%. Policy makers would set too easy a goal if they would declare that the US economy is on its way to recovery.